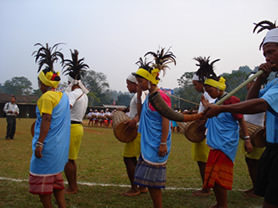 The Garos, who call themselves A·chiks, are the second largest tribe in Meghalaya. As such they are the dominant tribe and inhabit the greater parts of the present Ampati Civil Sub-Division. The Garos have a strong tradition that they have come from Tibet. According to their legend, the ancestors of Garo inhabited a province of Tibet named Torus, where without any apparent reason they started on a voyage of discovery under the leadership of two chiefs Jappa-Jalima and Sukpa-Bongipa. The Garos during medieval period earned notoriety because of the numerous raids they periodically made into the plains at the foot of the hills in the district of Goalpara and Mymensing. From time to time they would rally from the mountains recess to attack villages in the plains, murdering, plundering and burning down everything before swiftly retreating to the jungle, leaving behind only the headless corpses of men and women. On their return the whole village would gather round the captured heads and there would be feasting with the chanting of songs of triumph. With the passage of time in the medieval period, while the Garos in the Hills were divided into a number of petty Nokmaships the plain tracts along the fringes at the foot of the Hills came to be included in the many Zamindari Estates.The basic causes of these conflicts were often the high handed conduct of the sub-ordinate revenue officials who levied oppressive house taxes upon tributary Garos or extorted exorbitant tolls from the mountaineers who brought their goods mainly cotton to the frontier market for trade and barter. These arbitrary acts were a constant source of irritation to the Garos, who when provoked beyond endurance would send out raiding parties to burn and pillage the border settlements. These raids in turn led to retaliatory expeditions being mounted against Garos. The contact between the British and the Garos started towards the closed of the 18th century after the BrItish East India Company had secured the Diwani of Bengal from the Mughal Emperor, Shah Alam II. By the end of dry season in early 1873 the whole of Garo Hills had come under British occupation. A·wes settled in the whole of Northern hills and the plains at their foot. A·kawes: The plain Garos of Assam are known as A·kawes. Chesak: Sub-tribe occupies the North Eastern Hills touching the A·wes in North. Duals: Occupies the areas immediately to the south of the Chesaks. 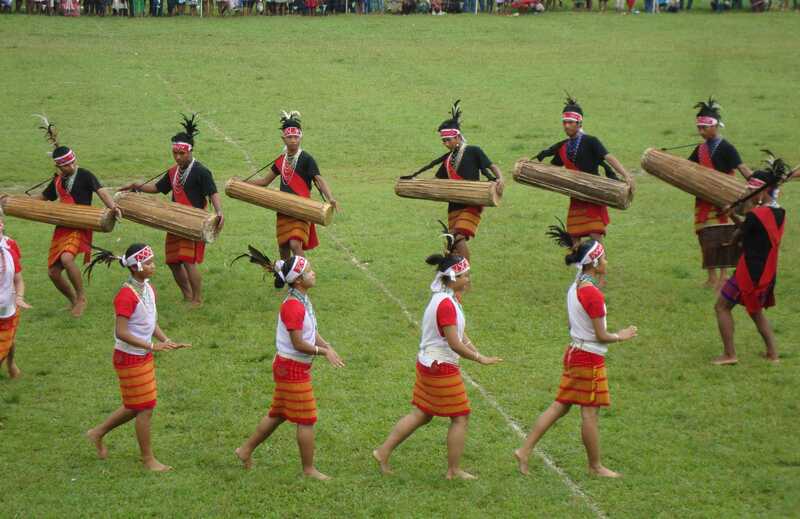 Matchi: Inhabits the central valley of the Simsang River to the West Duals, they occupy the heart of the Garo Hills and were for the production. The Matabeng or Matjanchi are found in areas north of the Simsang River. It is likely that they are mingling of the Am·bengs and Matchis. By far the most numerous division of Garos is that of the Am·bengs. They occupy nearly half the area of the districts including Tura Town. They occupy the whole of the Western Hill and the greater part of districts of the south of the central range. There is also a land of Am·beng settlement in the south eastern most corner of the district. The Chiboks live immediately to the east of the Am·bengs. They are few in number whose myth and general culture show considerable variations from those of other dialectical groups.The various forms of folk dancers which are distinct from other Garo dances are disappearing. The Rugas reside to the south of the Chiboks in the low hills bordering on the Mymensing district. 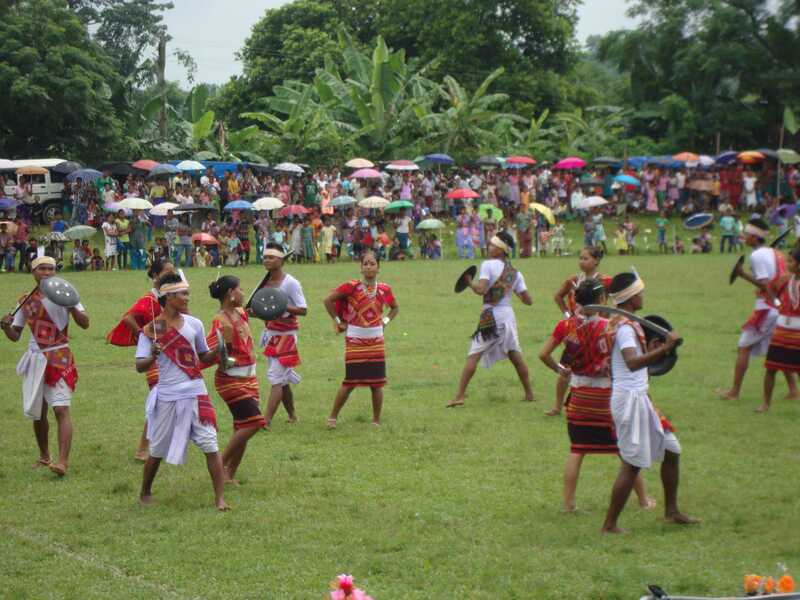 They are also a small and diminishing group whose general culture, dances and songs are different from other Garos. The Garos or the Ganchings live in the south of the district bordering Mymensing along the dancing river. They are famous for their craftsmanship in sculpture and house building. 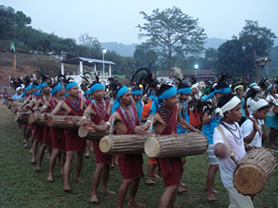 The Atongs forms an important division of the tribe. They occupy the south eastern portion of the Garo Hills bordering Mymensing. They have quite a different dialect from the other Garos. Their dialect is more akin to the Koch language than to other Garo dialects. The Megams are found on the eastern border of the East Garo Hills and in the West Khasi Hills districts. They are called	Lyngams by the Khasi and are fusion of Garos and the Khasiscan be taken as a hybrid race. Their appearance and customs resembles more closely the Garos but their language is more akin to the Khasis. But though Garos are ridden with dialectical groups and varied cultural traits, their roots are basically the same and all of them have the same tribal consciousness. There are five clans or exogamous steps called chatchi among the Garos, with a number of sub-clans called Ma·chong. Originally there were only two clans viz. Sangma and Marak. Later on, Momin, Arengh and Shira have been evolved out of the two original clans. Each of these clans have a number of sub-clans called Ma·chong or motherhood. The Ma·chongs are named after animals, birds, trees, bamboos, rivers and hills sub-clans names that some scholars called the Garos as Tote mists. Under a normal Garo marriage a husband is given the paternal authority in his new house. If the husband is a NOKKROM (husband of the heiress) he is placed next to his father-in-law, whose place he takes after his death. In a family, the husband is also given all the responsibilities for their family affairs. The wife is subordinate to him in spite of uxorial residence. The Garos are one of the few remaining matrilineal societies in the world. The individuals take their clan titles from their mothers. Traditionally, the youngest daughter (nokme·chik) inherits the property from her mother. Sons leave the parents' house at puberty, and are trained in the village bachelor dormitory (Nokpante). After getting married, the man lives in his wife's house. Garos are only a matrilineal society, but not matriarchal. While property of Garos are owned by the women, the men folk govern the society and domestic affairs and manages the property. This gives a solid security to the Garo women folk. Garo also have their traditional names. The simplest pattern of Garo family consists of the husband, wife and children. The family increases with the marriage of the heiress, generally the youngest daughter. She is called Nokna and her husband Nokkrom. The bulk of family property is bequeathed upon the heiress and other sisters receive fragments but are entitled to use plots of land for cultivation and other purposes. The other daughters go away with their husbands after their marriage to form a new and independent family. The Garos ascribe an heiress to family property from any of the daughters in which case, she is married to one of her father’s nephews, usually the girl loved most, obedient and well behaved succeeds to that title. There are cases also in which as heiress is married to a man outside her father’s clan. However, the culture of modern Garo community has been greatly influenced by Christianity. Nokpantes are glory of the past and all children are given equal care, rights and importance by the modern parents. The Garo language belongs to the Bodo branch of the Bodo-Naga-Kachin family of the Sino-Tibetan phylum. As the Garo language is not traditionally written down, customs, traditions, and beliefs are handed down orally. 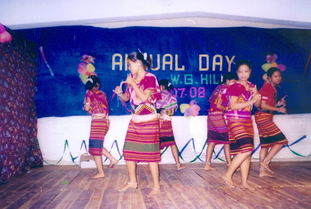 It is also believed that the written language was lost in its transit to the present Garo Hills. However, the modern official language in schools and government offices is English and the modern generation is more inclined towards English. Marriage ceremonies are diverse from place to place. In Garo custom, it is the girl who propose a match to the boy. The Garo marriage is regulated by two important laws, viz., Exogamy and A·kim according to the belonging to the same clan. Marriages are not allowed within the same clan. According to the law of A·Kim, a man or a woman who has once contracted marriage will never be free to remarry person of another clan, even after the death of his/ her spouse. They have a custom of supplying another wife/ husband from the same clan, in case their spouses are dead. Usually when a wife dies, one of the sisters of the deceased is given in marriage. Similarly, when a husband dies, one of the nephews of the deceased husband is given to her. It is only when no substitute can be arranged that the marriage bond is broken and the man/woman is free to marry any one of their own choices. The staple food of the Garos is rice. They also eat millets, maize, tapioca, etc. Garos are very liberal in their food habits. They rear goats, pigs, fowls, ducks, etc. and relish their meat. They also eat other wild animal like deer, bison, wild pigs, etc. Fish, prawns, crabs, eels and dry fish also are a part of their food. Their jhum fields and the forests provide them with a number of vegetables and roots for their curry but bamboo shoots are esteemed as a delicacy. They use a kind of potash in curries, which they obtained by burning dry pieces of plaintain stems or young bamboos locally known as Kalchi or Katchi. After they are burnt, the ashes are collected and are dipped in water and are strained in conical shaped in bamboo strainer. These days most of the town people use soda from the market in place of this ash water. Apart from other drinks, locally brewed liquor plays an important role in the life of the Garos. The principal garment of the Garo men is a strip of woven cloth about six inches wide and about six feet long. In the past they wove these clothes, some of which were ornamented with rows of white beads made of conch-shells along the end of the flap. They also used vests of black colour with lining at its ends. Garo women use an indigenous wrap-around known as Dakmanda and a body cloth. The men were a turban called kotip on the head but the women use head-bands. Narikki or sisa – made of a brass ring worn in the lobe of the ear. Ripok – Necklaces made of long barrel shaped beads of cornelian or red glass while some are made out of brass or silver and are worn in special occasions. Pilne – head ornament worn during the dances only by the women. The Garo household utensils are simple and limited. They consists mainly of cooking pots, large earthen vessels for brewing liquor, the cha·am (pestle) and rimol (mortar) with which paddy is husked. They also use bamboo baskets of different shapes and sizes. They use very limited furniture at home. The bamboo floor is generally enough for all their requirements. They also use a wooden stool hewn by themselves. In some houses, chairs made out of cane or bamboo, are used which are offered to the guest. Garos have their own weapons. One of the principal weapons is two-edged sword called Mil·am made of one piece of iron form hilt to point. Sometimes the yak’s tails adorn the hilt of a mil·am. The Garo name for a yak is matchik or dongru. There is a cross-bar between the hilt and the blade where attached a bunch of cow’s tail-hair. Other types of weapons are shields, spears, bows and arrows, axes, daggers, etc. Their traditional religious system, Songsarek, is generally described as animist, but from the latter part of the 19th century American Baptist, and later Catholic missionaries opened schools and hospitals in the Garo Hills. Most Garos are now Christians, with the majority belonging to the Garo Baptist Convention, smaller numbers of Roman Catholics, and also some Seventh-day Adventists and Anglicans. Traditionally their religion was a mixture of Pantheism and Hinduism. Like the Hindus and the Buddhists, the Garos believed in incamation of the spirit in man. The form of incarnation depends on his sin. The Garos believed in the “Supreme God” as locally known as “Dakgipa Rugipa Stugipa Pantugipa or Tatara Rabuga Stura Pantura”, or the Creator. Besides the Tatara-Rabuga, who created this earth, there are the deities of Chorabudi (Protector of Crops), Misi Saljong (God of Fertility), Goera (God of Strength), Susime (Goddess of Wealth), etc. In all religious ceremonies, sacrifices were essential for the propitiation of the spirits. They had to be invoked for births, marriages, deaths, illness, besides for the good crops and welfare of the community and for protection from destruction and dangers. Like the Hindus, the Garos used to show reverence to the ancestors by offering food to the departed souls and by erection of memorial stones. 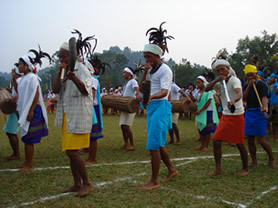 The common and regular festivals are those connected with agricultural activities. 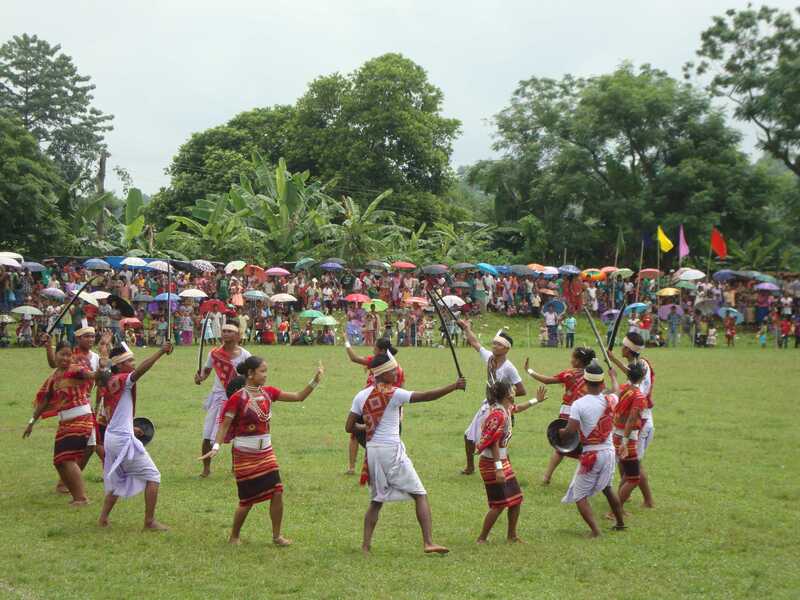 The biggest among the Garo festivals is the ‘Wangala’, which is a celebration of thanksgiving after harvest in which Misi-Saljong, the god who provides mankind with nature’s bounties and ensures their prosperity, is honoured. There is no fixed date for the celebration, this varies from village to village, but usually, the Wangala is celebrated in October-November. The Nokma or the chieftain of the village takes the responsibility to see that all arrangements are in order. A large quantity of food and rice-beer must be prepared well ahead. The climax of the celebrations is the colourful Wangala dance in which men and women take part in their best traditional attires. Lines are formed by males and females separately and dance to the rhythmic beat of drums and gongs and blowing of horns by the males. 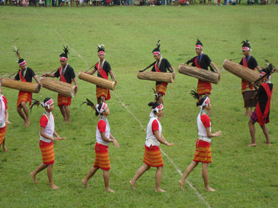 The Koch is a scheduled tribe inhabiting the Western Garo Hills of Meghalaya. The term Koch is derived from the words ‘Kochimuchi’ which means shrinkage due to shame.They claim that their original home was in the Arbella Hill range of central Garo Hills. They gradually came down to the plain area due to scarcity of Agriculture land. Another section of the Koch,however believe in myth which state that they are the descendants of two sisters Hira and Jhiva, daughters of the sun. Both of them were married to a man named Hajo. Hajo is also name of the place in the Kamrup district of Assam, from Hajo they came to Garo Hills. According to the accepted historical view (Kock 1984) the Koch appear to have migrated from the China. The original home of the Koches was in the place called ‘rasan’ mukprak tari (the hill where sunrises) or Udoigiri which is probably the sanskritized form the Koch term. Then they migrated to Kamrup and reached to Hajo. But from Hajo also they had to migrate for fear of paramrama the Koches originated from two sisters Mukdi and Kundi, who were daughters of the sun. Mukdi was married to Hajo, who after Mukdi's death married Kundi. In the migration from Hajo they reached Sonapur and thence they went to the place described as titli hacheng (Sand grains as big as tamarind seeds and stayed there for sometime. From there they migrated to a place called Rongjeng. From Rongjeng they continued their journey towards the south-west where they reached the Simsang River and followed its downward course. The crossed the river in a very difficult way. Twelve household failed to cross the river and they were left behind. This twelve households intermarried with the Garos. The other branch followed the course of the Simsang River and ultimately in the plain areas in the south-western portion of Garo Hills, they found the kingdom under powerful chief name Suryanarayan. After him, Mahindranarayan became the chief and during his time the Koch Kingdom was annexed to the British empire. Even today in Koch villages of Garo Hills Mahindranarayan is refer to as Pagla Raja (mad king) for his antics. He is also known as Okate Raja, King who tears opened the wound of pregnant women. There is a place in the south western corner of Garo Hills (under Ampati civil sub-division) which is called Mahindra-Ganj after the Koch King Mahindranarayan. The Koches are mainly concentrated in the western and south western part of West Garo Hills in the district of Meghalaya. They are also found in Assam, Manipur, Tripura, North Bengal, Bangkura in West Bengal, Purnia in Bihar and in Chittagong and Noahkali of Bangladesh. The Koch dialect is of Tibeto-Burman origin (Gait 1924). The influence of both Bengali and Assamese language is reflected in their dialect. The Hajongs are Scheduled Tribe. The name Hajong has a particular significance. In the Garo language “Ha” means earth and “Jong” means insect. They are called “Hajong” means insects of earth. This name was given to them because the Hajongs’ life and activity is deeply associated with land. In Meghalaya they are mainly concentrated in the plains of the south-west and the western border of the West Garo Hills District while some Hajong villages are situated in the East and the West Khasi Hills as well some of them also live in different districts of Assam. It is traditionally believed that the Hajongs for early lived in the Hajo area of the Kamrup District of Assam when their population increased and their cultivable land was found too scanty to sustain them, they left the place and set out insearch of a new land. First they settled at a place called Hachong. But they left the place and moved in a south westernly direction until they found this vast plain in the Garo Hills most suitable to their temperament as well as for cultivation. They settled in this place permanently and gradually extended their settlement in the south eastern direction along the foot hills of the Garo Hills and Khasi-Jaintia Hills. Though the Hajong nowadays speak the jharua dialect of Assamese or the Mymensingh dialect of East Bengal it is very likely they belong to the same branch as the Bodos, Koches and Rabhas. The Assamese dialect is a mixture of Assamese and Bengali, but the influence of the Assamese language is greater. 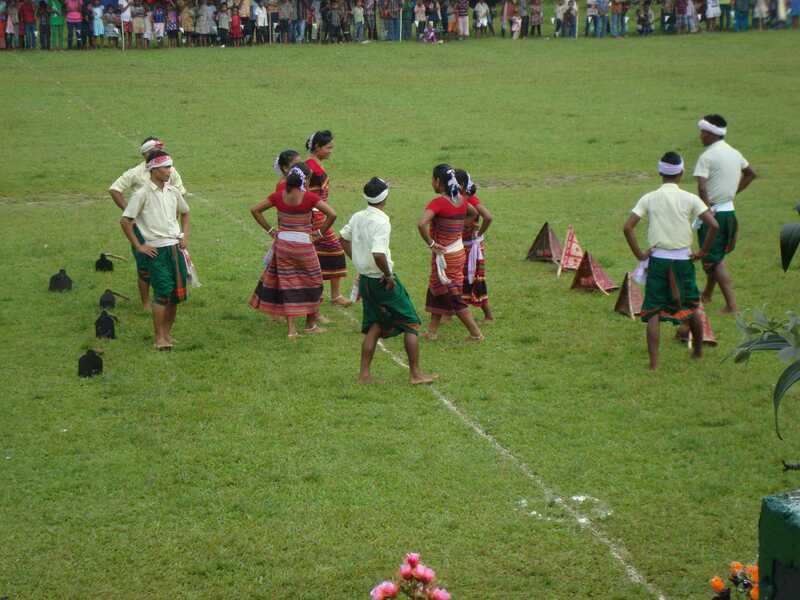 There are two broad sections among the Hajongs, namely the Khatal and the Hajong. The Khatal claim to be Vaishnavitie, though they still worship Kali and Kamakhya, the two Hindu deities of the Sakta sect. The main difference between the Khatal and the Hajong is that the former prohibit the use and preparation of the rice beer. The Hajongs engage a Bengali Hindu Brahman Priest for religious and social function while the Khatals follow the traditional system of engaging an Adhikari, a Priest from their own community, for similar functions. The religious practice, social customs and ceremonies observed by the Hajongs are influenced by two different orders of religious rites and social usages. Some of these have been greatly influenced by their neighbouring Bengali Hindu or Assamese societies, while others are the reflection or retention of their own traditional beliefs and customs in their social life. The Hajong clans were formerly organized on the basis of exogamous martini. There are about seventeen clans among the Hajongs namely Parachungwa, Chondi, Katagaon, Dinulgaon, Difragaon, Khasigaon , Phulgaon, Ghorabali, Koitar and Sonamukhi. In recent years some Hajong families have adopted Bengali-Hindu Clans names such as Kashyap, Bharaduaj, Sandilhya and Asattandanda. But clan exogamy is not strictly followed and marriages with members of the same clan now take place frequently. Endogamy is the rule of marriage among the Hajongs marriage with a member outside their community is strictly forbidden. Cases of such marriage are rare. Negotiated alliance is the usual form of marriage. The marriage proposal generally comes from the party that desires the marriage. The marriage ceremony generally takes place at the bridegroom’s residence. Among the Hajongs, both bride price and dowry are given, but in a very limited way. In the Hajomg society a widow or widower is permitted to remarry. The residence pattern among the Hajongs are patriarchal. Both the extended and the elementary form of the nuclear type of families are observed. After his marriage, a man usually lives jointly with his parents, married brother or unmarried brothers and sisters. The married son sometimes establishes a separate household and lives with his wife and unmarried children. It is reported that on very rare occasion, the married daughter along with husband lives with her parents. The father is generally the Head of the family and has supreme authority. Family among the Hajong is patrilineal in descent i.e. there is a strong emphasis on the male line and descent and succession to property. Giving away part of the land to the sons, during the lifetime of the parents is common, but sometimes such shares are also given to the daughters, if they establish separate households after marriage. 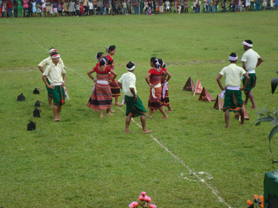 The Hajong maintain a good inter family relationship within their community. There is mutual co-operation between the members of the families in matter relating to cultivation of land and harvesting operations. The Hajong observe the taboo of pollution at the time of childbirth and death in a household. In case of birth, the household observes ceremonial defilement for a period varying from seven to ten days. The new born baby’s head is shaved by a Hindu barber, generally, on the seventh day after birth and the population period is considered to be at an end. In case of death of an adult member of the family the	period of ceremonial pollution varies from ten days to a month. Normally the Hajong cremate death bodies. Mainly the Hajongs own land individually. The common village land is confined to the place for worshipping the village deity the cremation ground and meadow lands.